Last week I went to two days of training with Speech Pathology Australia's queen of knowing everything about literacy, Dr Roslyn Nielson from NSW. They were two excellent days, jam-packed with blogworthy ideas and information, about which (it's only fair to warn you) I will be raving for some time. One neat metaphor for reading Ros presented is The Reading Rope, devised by US psychologist Dr Hollis Scarborough, who has kindly given me permission to put it in this blog post, as long as I don't alter it, and include the published source1. Dr Scarborough emailed me saying, "I drew it originally for talks with parents and I think it works especially well for that purpose", and I think a plain English blog about sounds and spellings is probably the internet equivalent. 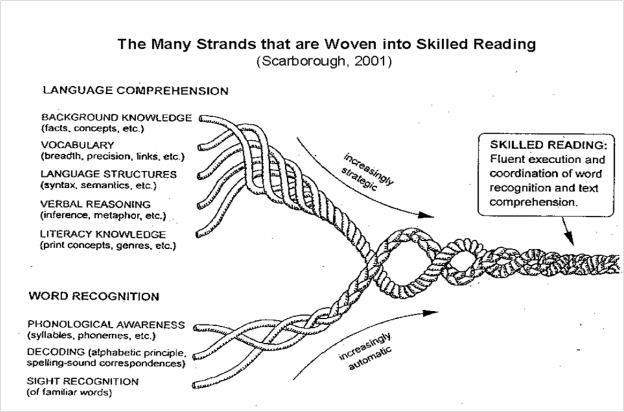 According to the Reading Rope metaphor, skilled reading is like a rope woven of many strands. At the top are multiple Language Comprehension strands – background knowledge, vocabulary, grammar, semantics, verbal reasoning and knowledge about literacy itself, for example how a book is organised and the difference between fiction and non-fiction, formal and informal writing, and a letter and an advertisement. At the bottom are some Word Recognition strands – awareness of the sound structure of words, the idea that letters of the alphabet represent sounds, knowledge of which letters/patterns correspond to which sounds, and recognition of familiar words. These twist together to form the two main strands of the rope. With practice, weaving the main lower, Word Recognition strand becomes more and more automatic, until it is done effortlessly and unconsciously. At the same time, language skill development, practice and life experience allows you to weave the upper strand in an increasingly strategic way. If any of the strands are weak or not tight enough, this affects the strength of the whole rope. Language disorders significantly weaken the upper strand, which is one of the reasons most children with language disorders struggle with reading (as well as listening, speaking and writing). Poor phonemic awareness and spelling pattern knowledge lead to a weak lower strand, again weakening the whole rope and making fluent, skilled reading for meaning difficult. There's no similar diagram of the Writing Rope, but if you drew one (I won't try, I can't draw for nuts) it would have to include all the strands of the Reading Rope, and more. Writing invariably involves reading (well, most of us check what we have written before we show anyone else), whereas we often can and do read without writing. Writing is a complex fine motor activity, whether you're typing, holding a pen or up a ladder with a paintbrush. Writing taxes your spelling pattern knowledge much more than reading does – how many people do you know who can read but not spell well? Writing involves planning a text and thinking about the audience's perspective more than reading does, plus you have to use expressive language rather than receptive language when you write. Most people find putting an idea into words harder than understanding someone else doing it. "I didn't know Speech Pathologists worked on reading"
The Reading Rope is about the best answer I've seen to the question, "What have Speech Pathologists got to do with reading?" On the surface, reading looks like a simple, visual activity, but when you take a closer look at the strands from which it is made, it's very complex, and most of the strands are related to speech sounds and/or language. Weaknesses in the speech/language strands are as much core business for Speech Pathologists as other communication difficulties. 1. Scarborough, H. (2001 Connecting early language and literacy to later reading (dis)abilities: Evidence, theory and practice. In S. Newman & D. Dickinson (Eds. ), Handbook of Early Literacy Research.pp. 97-110. New York, Guilford Press. This entry was posted in theory on April 17, 2013 by alison. We, at Sounds-Write, have been using the rope metaphor for some time. It's good but I have one reservation: the expression 'sight recognition of familiar words' is ambiguous. Any mention of 'sight recognition' is likely to encourage teachers to reach for their 'sight word' list and mix their methods. I'd prefer something like 'words that can be decoded automatically', or something similar to give the idea that a certain degree of automaticity has been arrived at. Yes, I think we need to be really clear that “sight word recognition” does not mean that you have memorised a word like a picture. It means that you have learnt to read it like all other words – both the familiar and the tricky spellings – and have now read it enough times now that you can just look at it and know what it is. I agree it’s about automaticity, and there is no special list of words that can’t be decoded.